So yesterday I went to see Tribes by Nina Raine at the Gate. It’s running as part of the Dublin Theatre Festival, and is the second production in Selina Cartmell’s inaugural season at that theatre. I’d been delighted when I’d seen the play in Cartmell’s programme. 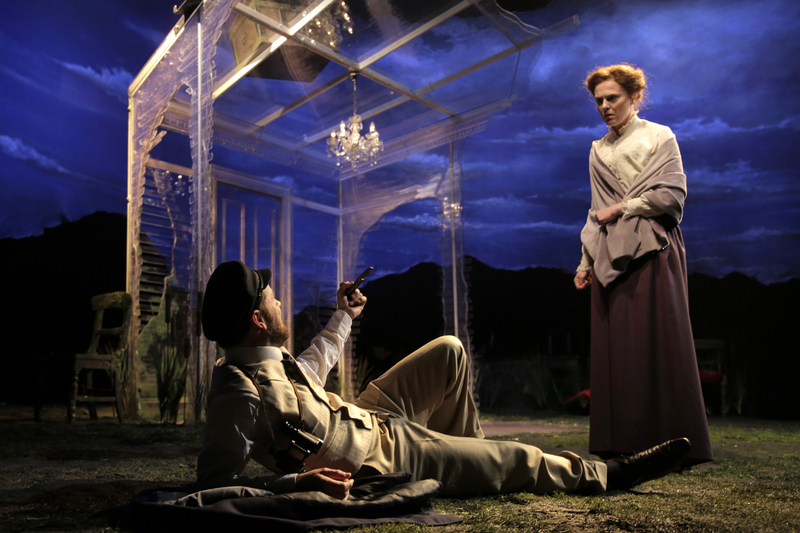 Raine’s play has been successful throughout the English-speaking world, and if this blog has an idée fixe, it’s that Irish theatre has been at its healthiest when it engages with international work. Good international plays allow our actors, designers and directors to push themselves in new directions, and they stimulate the creation of new Irish plays. There is more than a hundred years of evidence that shows this happening, from the Dublin Drama League producing the Gate in the 1920s, to the way in which the new wave of Irish writers in the 1960s were responding to Brecht and Tennessee Williams, and so on. 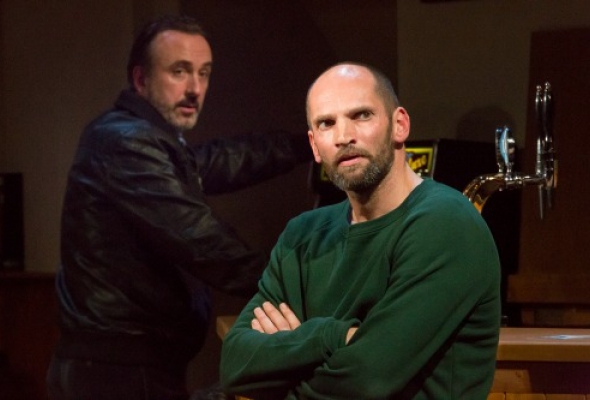 But I also think Tribes is a good play in its own right, and was glad to have the chance to see it – just as I’m very excited by the chance to see productions like Assassins and Look Back In Anger at the Gate next year. On first glance, the set-up of Tribes might seem a bit clichéd, a riff on the “Guess Who’s Coming to Dinner?” theme. We open in the living room of a family whose three adult children include a son, Billy, who has been deaf since birth – and as the action develops, we learn that Billy intends to bring home a first “proper” girlfriend (Sylvia, a young woman who is going deaf) to meet his parents and his brother and sister. His family welcome the idea of Billy being in a relationship, but not unreservedly so – both his father and brother fear that they might lose him to what they call (not at all positively) the “deaf community”. So the play concerns Billy’s attempts to establish his independence while also trying to negotiate around the different loyalties that he owes to the people in his life (the different “tribes” of the play’s title). Insofar as the plot is concerned, then, we are dealing with the fundamental topic of many great plays, which is how we change: how we deal with the pain of changing, how we deal with the pain of not changing. But layered on top of that theme is an exploration of communication and meaning, one that considers how we share feelings and concepts with each other and thereby build communities. For example, there are some very interesting explorations of how music means, and the careful choice of songs – from We Come 1 by Faithless to “The Humming Chorus” in Madame Butterfly – allows us to think about the relationship between sound and emotion. This is made movingly evident in a scene in which Sylvia plays Clair De Lune – something she knows she won’t be able to do once she becomes completely deaf. That scene also highlights one of the play’s most interesting forms of stage-craft, which is the theatricalisation of the production’s surtitles. These are projected on screens above the playing area in the first couple of scenes in order to make clear what Billy is saying when his speech becomes less distinct, or to “translate” sign language into standard English. But gradually the screens start to use other forms of communication: musical notation, CCTV footage, projections, and ultimately the private thoughts of the characters as they argue with each other (from the sarcastic “We’re in a Pinter play” to the simple “I love you”). Just as the characters are thinking about how body language, signs, words and music combine to build relationships, the production is also thinking about how theatre communicates to audiences. All of those features make this a stimulating and engaging play, but the reason that it needs to be seen is the quality of the production. Given Raine’s focus on themes of belonging and identity, it is of the utmost importance that the action has been moved from the south of England to what seems to be Dublin – with only the tiniest of changes to the script being necessary (for example, where Raine’s original says that The Guardian want to profile Billy, the production makes it The Irish Times). It says something very significant about Irish drama – and Irish culture more generally – that middle class Dublin is seen here as being more or less interchangeable with middle-class England. Yes, identity in the play is very fluid anyway – the father of the family is played by Nick Dunning as English, but the rest are Irish; they identify themselves as Jewish, but also grapple with other identities related to deafness, mental illness, Irishness, being a “northerner”, and so on. While it is important that we have plays that explore the distinctive qualities of Irish life, it feels significant that this production of Tribes shows our links with other cultures, and in particular that it demonstrates how new English drama has something meaningful and immediate to say to Irish audiences. This relates to a broader pattern that we’re seeing on the London stage, one that was evident when Denise Gough presented her character in People, Places and Things as Irish without the script needing her to do so – or that has Conor McPherson casting lots of Irish actors in his excellent Bob Dylan musical The Girl from the North Country – or that (much more problematically) sees The Ferryman being celebrated as the best new British play of this year. In London it’s clear that Ireland is no longer seen as “Other” in quite the way that it once was, so it is interesting that this production of Tribes is reciprocating that way of thinking about what we have in common with our nearest neighbour. It’s also very exciting that the production of Tribes is true to the history of the Gate, while also representing a new departure. The Gate always showed that one way of being a national theatre is to stage excellent Irish productions of international works. Tribes is very much in that spirit, showing Dublin audiences something new that could open up avenues for our own writers, directors, designers, actors, and theatre-goers. There’s also the pleasure of seeing a strong ensemble working very well together. We have Nick Dunning and Fiona Bell’s finely choreographed representation of a marriage that involves both intimacy and hostility. As the oldest brother Daniel, Gavin Drea gives a very considered presentation of a young man who is grappling with mental illness and thwarted desire – one of those performances that in Reviewese a newspaper critic might call a “revelation”, not only because it shows us truths that we might not have been aware of, but also because it gives Drea a chance to do things technically that I hadn’t know he could do. In the less developed role of Ruth, Grainne Keenan gives a very subtle exploration of what it’s like to be the person who is most often ignored in a family, the person who is often most in need of attention and least likely to get it. And as Billy, Alex Nowak presents his character’s development with a moving intensity, allowing us to sympathise with him when necessary, condemn him when necessary, and ultimately to accept him. But the key performance is given by Clare Dunne as Sylvia. I last saw Dunne in the Donmar’s Shakespeare Trilogy in London (soon to be broadcast to cinemas), and was very struck by the fact that although people went into the theatre talking about Harriet Walter, many of them came out talking about Dunne, whose Prince Hal in Henry IV was (let’s use the cliché again) a revelation – not only about Hal, but also about how gender works in Shakespeare, and how Irishness can be used to find things in Shakespeare’s plays that were always there but have been forgotten (she played Hal with a broad Dublin accent). Here as Sylvia she very noticeably lifts the play when she arrives in the fourth scene, giving a performance that is massively sympathetic. There’s a parallel in the script between Billy’s movement away from his family on the one hand, and Sylvia’s movement from hearing into deafness on the other – and this parallel allows Dunne to present a very carefully prepared performance that is technically excellent in terms of voice, movement, and her physical interactions with the other actors. But what Dunne is also showing us here – as she did for Hal in Henry IV also – is how change produces feelings of both loss and elation in us. She is one of those actors who knows how to resolve contradictions, showing us that part of the complexity of the human condition lies in working out how to reconcile the clash between loss and discovery. So I loved the rigour and complexity of the acting – which, of course, has to be attributed to the direction of Oonagh Murphy. It’s exceptionally positive to see her being given the space of the Gate stage to show what she can do. And I also need to mention the excellent design by Conor Murphy, Mimi Jordan Sherin, Ivan Birthistle and Conan McIvor. But there is one other point to be made. When I saw Tribes yesterday, the auditorium was considerably less than half full. 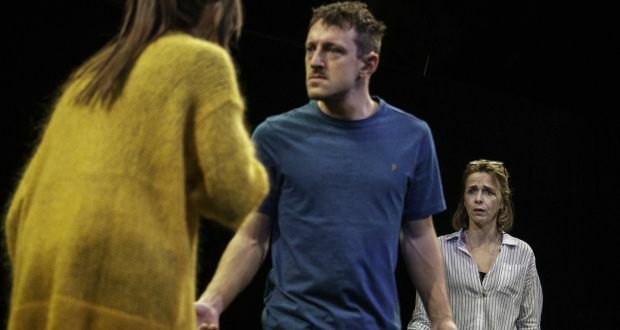 Yes, it’s the middle of the Dublin Theatre Festival, and yes Raine is not a well known writer, and the cast isn’t starry in the way that the Gate’s DTF productions have sometimes been in the past. But I thought this lack of audience interest was a shame, not only because it’s new international work but also because it’s written by a woman, directed by a woman, programmed by a woman and has roles for three women and three men. Post-WTF, this is the kind of work that needs to be supported and seen. But there are many reasons to see this play, starting with the fact that it’s a good night out: if you love plays, if you love drama, if you love theatre – you should just go. One final note – one of the other very positive changes recently introduced to the Gate has been the quality of its graphic design and PR material. Has there been a more striking poster for a new production in Dublin this year than the image below? A couple of months ago, I posted a note asking why we don’t see more non-Irish plays here in Ireland. The argument I made was that the staging of new and classic international works has an impact on the development of new Irish practice: that the production of great Irish plays helps to develop writers, directors, designers, performers and audiences in important ways. There is a lot of evidence of this kind of causal relationship between international work and Irish practice in the history of modern Irish drama. We know, for example, that by producing European and American plays the Dublin Drama league helped to inspire a lot of the work that emerged in Ireland from the late 1920s onwards – not just in playwriting but also in direction and design. There’s a case to be made that without the DDL you wouldn’t have had the Gate Theatre, and its focus on European ideas about performance and design. Likewise, the Pike in the 1950s premiered work by Behan and Beckett but also made a point of producing international work, including plays by Tennessee Williams, whose play The Rose Tattoo famously led to that theatre being raided by the police in 1957. And both Druid and Rough Magic started out by producing quite a lot of non-Irish work in the 1970s and ‘80s respectively, before developing to a point where they could focus more on Irish writing. Garry Hynes has spoken interestingly about how her company produced plays by writers like Dario Fo before it “grew up” and started doing new Irish work, for example. Throughout the history of modern Irish drama and theatre, many people have expressed the fear that by engaging with international work we might damage Irish drama – that it might be diluted or overpowered. But the reverse is true: Irish practice has been strongest at periods when there has been a good level of awareness of writers and ideas from outside the country. So for these and other reasons I was glad to have the opportunity to see a very strong production of A Streetcar Named Desire at the Gate earlier this week. The production has been getting very positive reviews, with most commentators praising the quality of the acting, especially by Lia Williams as Blanche. It thus drove home to me the extent to which the Gate has contributed so much to Irish practice in terms of acting. In fact, the theatre recently organised a World Actors Forum – the idea being that if Davos can host economists, Dublin might justifiably do something similar for acting. I can understand why the Gate might want to stake a claim to world-leading expertise in acting, not only for Dublin but also for itself. The theatre has in general been omitted from (or played a very small role in) the standard histories of Irish drama – mainly due to the fact that, even now, most published scholarship about Irish theatre explores the history of Irish plays. The Gate has of course presented some notable premieres, from The Old Lady Says No to Philadelphia Here I Come! – and it usually gets credit for that. But I think it’s fair to say that in any history of Irish drama from the last 20 years or so, Field Day has received more attention than the Gate, and of course the Abbey still dominates. The Gate is definitely mentioned, often appreciatively, but rarely discussed in any depth or detail. But if we wrote our histories of Irish drama based on acting rather than writing then the Gate would surely have a dominant role. Likewise, a history of Irish stage design would have to focus an enormous amount of attention on the Gate. At a time when our scholarship is moving much more towards theatre studies rather than drama studies (that is, we research the plays that are produced in Irish theatres rather than looking at plays that are written by Irish authors), the Gate is starting to get more attention, particularly for its impact on Beckett. Indeed, I’m aware of two PhDs currently being written on the history of the Gate – one of them by Des Lally here at NUI Galway and another in Holland. But there’s still a lot more work to be done on the theatre and its influence. So while watching Streetcar I was struck by the ways in which the Gate can strongly be associated with ‘the actor’ (and the singular is deliberate). I’m thinking here (of course) of Mac Liammoir, and also of the way in which the theatre has during its history hosted such actors as Orson Welles. That tradition has continued under Michael Colgan, who has produced many high profile shows that are dominated by single strong figures. There are many examples of this: Michael Gambon in Krapp’s Last Tape and Eh Joe; Ralph Fiennes, Ingrid Craigie and Ian McDiarmid in Faith Healer; Owen Roe in Uncle Vanya and Faith Healer; John Hurt in Krapp’s Last Tape; Lia Williams in Eccentricities of a Nightingale; Cillian Murphy in The Shape of Things; Jason Patric and Flora Montgomery in Bash; Barry McGovern in Watt and and so on. This is not to say that they ignore ensemble: think of the quality of their Homecoming with Ian Holm, Ian Hart, Nick Dunning, Lia Williams and John Kavanagh – or of their long-running Godot – or Selina Cartmell’s Festen and Sweeney Todd. But they are a theatre that has done much to promote an awareness of the importance and perhaps even the mystique of the actor. This goes far beyond the business of casting celebrities in order to gain an audience (though Michael Colgan spoke openly in his Theatre Talk interview about the commercial benefits of what he called “eventing”). What I’m suggesting here is that one of the important aspects of the Gate’s ethos is the staging of plays that provide lead actors with opportunities to show their virtuosity, by playing challenging roles in well known Irish and international plays. So Streetcar is in many ways a quintessential Gate Theatre production, not just because it’s directed and designed to a high-standard, but because it’s a celebration of the skills and dynamism of Lia Williams. There are also outstanding performances from Garret Lombard, Denis Conway and Catherine Walker in the play’s main supporting roles. As Stanley and Stella, Lombard and Walker seem unusually relaxed in their roles, while Conway’s carefully controlled voice and movements convey the sense in which his character (Mitch) is both decent and cowed. And Williams’s performance is seriously impressive, mainly because she does such a good job at showing that Blanche is essentially a very hammy actor in a play that no-one else wants to participate in. For instance, there’s a very nice moment between Williams and Lombard, when Stanley has grabbed some of Blanche’s letters which have fallen to the floor. Blanche desperately wants these letters back and also wants them to remain untouched by anyone – yet she’s very frightened of Stanley. So she twice reaches towards the letters, about to grab them from Stanley’s hands – but at the last minute pulls back. This conflict between Blanche’s fears and her desires is genuinely dramatic, and actually very touching. At the third attempt, while reaching forward Blanche suddenly turns her hand around – moving from a grabbing gesture to a supplicatory one. Stanley then hands over the letters. In those three movements, we learn a lot about Blanche (her ability to use acting as a way to manipulate others, the strength of her feelings for her former lover, and so on). And we also learn that what threatens Stanley most about Blanche is that she is prepared to assert and act upon her own desires. A key question here is whether those gestures are being performed by Williams for the audience, or by Blanche for Stanley – and the answer is that both of those suggestions are probably true. All of that is evident from the script, of course, but these small gestures help to fill out the characters in new ways. 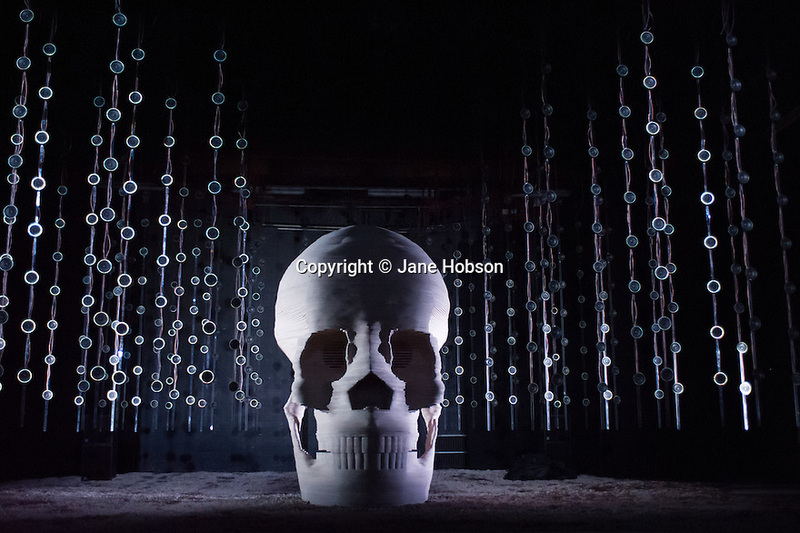 I was also very struck by the quality of the lighting design, which is by Paul Keogan. The Kowalskis’ home is on a slightly raised platform on the stage, and all of its walls are exposed. This means that we can see lights all around the stage, including from the back – so occasionally the lights glare right out into the auditorium. I loved the fact that the positioning of the lights meant that we never lost sight of the fact that we were watching a play: the stage mechanics were obvious not just in the lights but also in the ways in which the actors drew curtains, picked up discarded props, and so on. This was a reminder that Blanche is never off-stage: she’s constantly performing, constantly acting as if she’s in a spotlight. So the design did much to underline Blanche’s theatricality. Some of what I’m trying to convey about Keogan’s design is evident from the photo of Catherine Walker below, which is by Peter Rowen, and which I have copied from the production website. The lighting also guarantees that the audience would never fully see Streetcar as an example of cinematic realism. There’s a simple way to make a mess of any production of Tennessee Williams, and that’s to ignore his plays’ expressionistic qualities. If you direct Streetcar as if it were written by, say, Arthur Miller, its symbolism and language will seem heavy-handed. Instead, we need to feel that the world on stage is being presented as if seen through Blanche’s eyes: it needs to be vaguely histrionic, melodramatic, over-wrought. Keogan’s lighting helps to achieve that impact brilliantly: he uses vivid reds, greens and blues to capture and emphasise Blanche’s changing moods, and to show that for Williams there is often a strong link between colour and emotion. One of the things I always enjoy about Keogan’s lighting is that you can see how carefully he’s read the script – and here he is revealing aspects of the play that could easily have seemed heavy-handed but now seem fresh and even original. Denis Clohessy’s sound design is also really excellent: we have a constant sense of the world beyond the stage – and thus of the ways in which Stanley and Stella are part of a much bigger community. That design gives their home a sense of warmth but also adds occasionally to Blanche’s sense of being trapped. So again this emphasised to me how important the Gate has been for Irish stage design. Hilton Edwards is important here, but it’s worth recalling that the theatre has also hosted work by people like Louis Le Broquy and Robert Ballagh too. All of this shows that the direction too is impressive, mainly because it was so unobtrusive. Ethan McSweeny does bring an original approach to the play. The casting of Conway as Mitch, for example, shifts the dynamic quite interestingly: the character is supposed to be in his early 30s, but here is older – making Blanche’s play for him seem more opportunistic and Mitch’s eventual disillusionment more poignant. 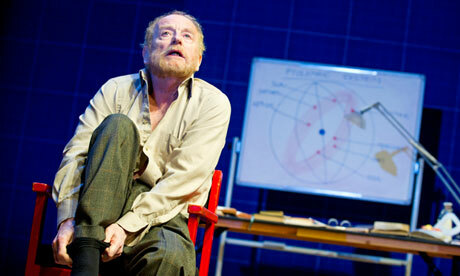 But McSweeny also delivers a very solid and faithful production of a very difficult play. In terms of technical accomplishment it reminded me a lot of Annabelle Comyn’s staging of Tom Murphy’s the House at the Abbey last year. As someone who teaches drama, I’d have loved to take students who are just starting out to see this production. I’d expect that they’d learn a lot about how to act and indeed how to direct from watching it – but I’d also expect them to be excited by the excellence of the design too. This is a production in which everyone involved is, to use a cliché, at the top of their game: it shows how good you need to be to create this kind of theatre – but it also shows how enjoyable theatre can be when it’s done really well by disciplined, talented practitioners. One final note. I’ve mentioned before that many Irish writers state that their main influence is not another Irish dramatist – but is in fact Tennessee Williams. Perhaps it’s because I was thinking of her statement at the Synge School that she’d love to direct Williams’ plays, but Marina Carr’s presence seemed palpable throughout this production. There’s a moment, for example, when Blanche appears in a white dress with a veil over her head – and for a moment I had a flashback to Olwen Fouere in the same costume in Carr’s By the Bog of Cats back in 1998 (given the play, this was probably post-traumatic stress disorder). Likewise, the stylised direction of the scene in which Stan attacks Blanche immediately reminded me of Tom Hickey as Red Rafferty in Druid’s On Raftery’s Hill. This illustrates again that there is a strong symbiotic relationship between international and Irish drama, that Irish plays are richer because of the influence of non-Irish work.